Thursday evening in Gatlinburg promises Appalachian fun, LOTS of delicious food and live music as the annual Gatlinburg Beans and Cornbread Festival starts at 5 pm, May 12, 2016. The event is sponsored by 100-year-old Bush Brothers & Company, a native Tennessee operation headquartered close by in Chestnut Hill, a mere 25 miles away from Gatlinburg. The festival evening features a cook-off with competing dishes from local eateries, all including the famous Bush’s Best beans – the humble yet versatile and nutritious side-dish that cornbread seems to have been invented to go with. Of the many different recipes on the table, the most closely held secret must be the Bush recipe itself, and there us no hope that the company will reveal this – Duke the dog may talk but he ain’t spilling the beans! Live music is supplied by Tara Thompson, a fast rising name in Nashville circles, and most recently the opening act for Loretta Lynn, who is herself no stranger to the Gatlinburg and Pigeon Forge area. Tara brings an attention-getting act to Parkway with a lively set of music, and it’s free. If you want to sample the many rare dishes on display, $10 buys you the sampling spoon, while kids aged 7 and under can sample for free. 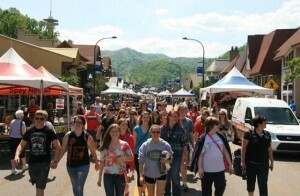 The event is on Parkway in Gatlinburg, between traffic lights #6 and #8. It starts at 5 pm and lasts until 8 pm.